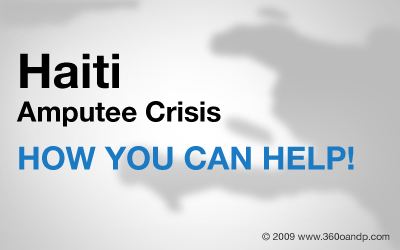 How you can help the injured, disabled and amputees in Haiti. Physicians for Peace, in partnership with Hanger Prosthetics and Orthotics, is accepting new and used prosthetics at more that 650 Hanger locations across the United States. Haiti has a long recovery road ahead, and the restoring, rebuilding and retraining process Physicians for Peace is engaged in will take part over the coming days, months and years. What was not destroyed in the earthquake has been damaged or looted since. Reports from our partners on the ground are grim, but we are hoping to send a team of nurses down to Haiti in the near future, as nursing care is an area of dire shortage. We also know that recent amputees will need at least 2-4 months of healing before we are able to fit a prosthetic device. During that time, we will work with our partners to identify whether we can use existing structures or somehow build temporary work space and bring in the specialized equipment needed to prepare and fit prosthetic devices: ovens, routers, vacuum pumps, drills, sanders and saws, as well as generators and lights. Once the equipment is set up, we will be able to ship containers of supplies (refurbished prosthetic limbs and mobility devices) and also to send prosthetists and physical therapists to work on a 2 week rotating basis for as long as possible to meet the projected overwhelming demand. These teams will work side by side with our surviving staff on the ground in Haiti, and will train new specialists to continue the work of the Walking Free program long after the immediate crisis has subsided. Physicians for Peace has been providing medical education and training in Haiti for several years, particularly in rehabilitation for trauma victims through its internationally recognized Walking Free program. The Walking Free Program’s partner network includes Healing Hands for Haiti and St. Vincent’s School for Handicapped Children, both in the capital city of Port au Prince. Healing Hands for Haiti has been providing Orthotic and Prosthetic services to the people of Haiti since 1998 using both US and Haiti specialists. St. Vincents School for Handicapped Children is a multi-service facility that provides preschool through high school education, vocational training, physical therapy and medical care. The medical clinic, which includes a small surgical suite, sees over 1000 patients a month for primary care, developmental evaluation and 20-30 corrective surgical procedures.